Idea: Use these ornaments as gift tags to add charm and an extra special surprise to your holiday gifts! 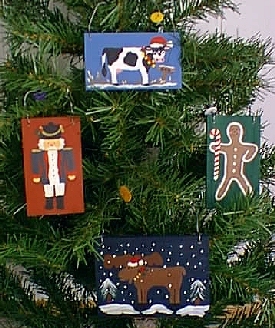 Instructions for painting each ornament are shown below. For a copy of painting patterns: CLICK HERE. Wood should measure at least 3 1/2" x 2". Colors needed: Brandy Wine, Indigo Blue, Bright Red, Hunter Green, Gold, Peach, White, & Black. Completely paint wood with Brandy Wine. Using the pattern & instructions from the page link above, transfer the soldier to the wood. Paint the soldier's face and hands with Peach. Paint his coat sides, coat sleeves and hat Indigo Blue. Paint his shirt and pants White. Then paint on the Gold trim on his hat and shoulders. Use Hunter Green for the holly leaves on his hat. Paint his coat facings and cuffs with Bright Red. Mix a little Bright Red with White to paint his nose. Slightly thin some white and brush on a mustache and hair. Colors needed: Hunter Green, Beige, Bright Red, White, Black. Completely paint wood with Hunter Green. Using the pattern & instructions from the page link above, transfer the gingerbread man to the wood. Paint the gingerbread man with Beige. Paint the candy cane completely white. Paint a thin strip of white along the line just inside the outer edge of the gingerbread man. Dot White paint for the buttons. Paint the stripes on the candy cane with Bright Red. Mix a little Bright Red and White to paint the cheeks. Use Black dots to make eyes, nose, and to draw a thin line for his smile. Colors needed: Country Blue, White, Black, Bright Red, Hunter Green, Sunlight, Beige, Dark Beige. Completely paint wood with Country Blue. Using the pattern & instructions from the page link above, transfer the cow to the wood. Paint the White parts of the cow first. Paint the Black parts of the cow. Mix some Bright Red with White to paint the cow's nose, inner ears, and udder. Use a dot of White for the cow's star on its head. Use Black dots for the cow's nostrils. Paint the hat and collar Bright Red. Paint the holly leaves with Hunter Green. Use dots of Sunlight for the bells on the collar. Use dots of Bright Red for the holly berries. Paint the sign with Dark Beige. Use the White again to highlight some of the grass with snow, on top of the sign, and on the ground. 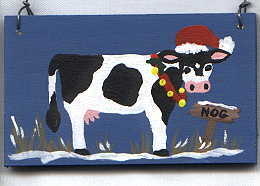 Finally, paint "NOG" on the sign in Black. Wood should measure at least 3" x 4 1/4". Colors needed: Indigo Blue, Beige, Dark Beige, Hunter Green, Bright Red, Sunlight, White, and Black. Completely paint wood with Indigo Blue. 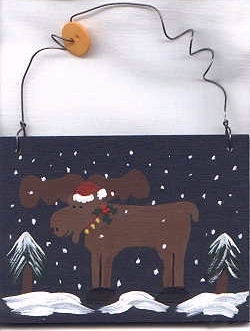 Using the pattern & instructions from the page link above, transfer the moose to the wood. Paint the moose body Beige. Paint the moose antlers and the tree stumps Dark Beige. Paint the moose hooves Black and draw a thin Black line to separate the legs and for the mouth. Make small dots for eyes and nostrils. Paint the collar and hat Bright Red. Paint the holly leaves Hunter Green. Use dots of Sunlight for the bells on the collar and dots of Bright Red for the holly berries. Paint the White parts of the hat and highlight the trees with White along the lines. Paint the snow on the ground with White following the direction of the arrows. Randomly dot snow in the sky around the moose and a little over him too. Drill two small holes about 1/4" from the top corners of the ornaments. Bend the wire so that it comes together at the top edge of the wood and twist together. Wind the wire around a pencil a couple of times. Put a button on the wire. Wind the wire around a pencil again a couple of times. Bend the wire together again like you did with the other side, twist the wire and trim the end if necessary.